Taking the first step to mastering colored pencils couldn't be easier than with Jumpstart's crystal clear lessons. This Level 3 Ladybug lesson by Cynthia Knox teaches you how to create lush, vibrant colors using her wonderful burnishing technique. Just these 19 colored pencils needed. So let's Jumpstart your colored pencil skills right away! 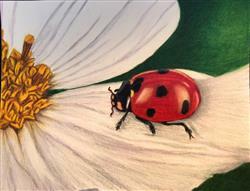 You are just 8 easy steps away from finishing this sweet ladybug scene. You'll learn so much and be so proud of your results. I enjoyed this kit so much!! I love the way it turned out and I learned some tips from the instructions...I love the way the items were shipped and packaged..so sweet!! 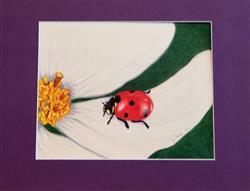 It was fun to color this ladybug. A bit frustrating doing the shine on the ladybug--took my brain a moment to figure it out. But, it was just a fun picture to learn on. I would highly recommend getting this product! This learning kit is great. I learnt a lot on the minor details and the result is fascinating. How to upload the photo of my drawing here? Our first and main goal is to create excellent instruction for colored pencil artists, so your review makes every one of us happy. Thank you so much for taking the time to review the Ladybug Jumpstart! Have read the instructions a couple of times. Ready to trace and draw.